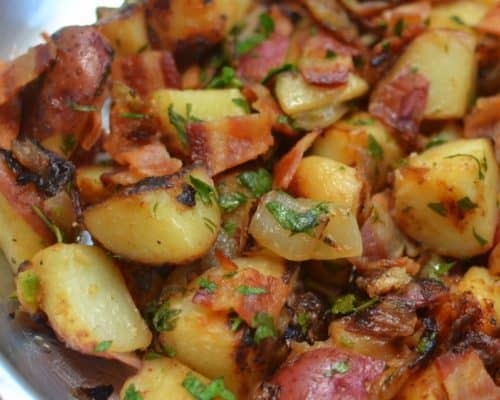 This Skillet German Potato Salad is darn near the best potato recipe I have ever made. So savory and full of so much flavor. In large pot boil potatoes for 15 minutes. Place under cold running water to stop the cooking process. Cut into large bite size chunks and set aside. Place bacon on cookie sheet Bake in oven at 375 degrees for 7 minutes. Turn bacon and cook for another 7 minutes or until crispy. Remove from cookie sheet and place on paper towel to drain. Do NOT dispose of bacon grease. In medium bowl whisk vinegar, sugar, water, olive oil and Dijon mustard. Place 2 tablespoon bacon grease in large skillet over medium heat. Add onion and cook 3-4 minutes. Add chopped potatoes and cook an additional 5 minutes or until starting to brown on the edges. Add additional bacon grease when necessary to keep things from sticking to the pan.. Whisk vinegar mixture and pour in 1/3 at a time cooking 1-2 minutes after each 1/3. Stir in chopped bacon and parsley.